Good morning friends. It’s a Monday, for sure. I’m going to be honest, I’ve not been looking forward to this post. Like the classic stereotypical American, I was all excitement and energy and motivation on January 1st; but, by about the 15th, I was struggling to find my mojo. Top that with a snow storm that “trapped” me in the house for five days and a sick baby that kept me sitting in a chair watching The Bachelor (#hardlife) for three more, and this was NOT my most successful month ever. Not.even.close. Have you given up on me yet? Goals are hard for me. I LOVE thinking about them and writing them down. I love making plans. But, the truth is, most weeks I’m feeling really good if my kids have clean clothes, I’ve cooked a few meals, and the dog hair hasn’t killed anyone. Seriously. The truth is, I want more than that, but I also don’t want to live in a place of constantly feeling guilty and like I’m not enough. I am. And you are too. 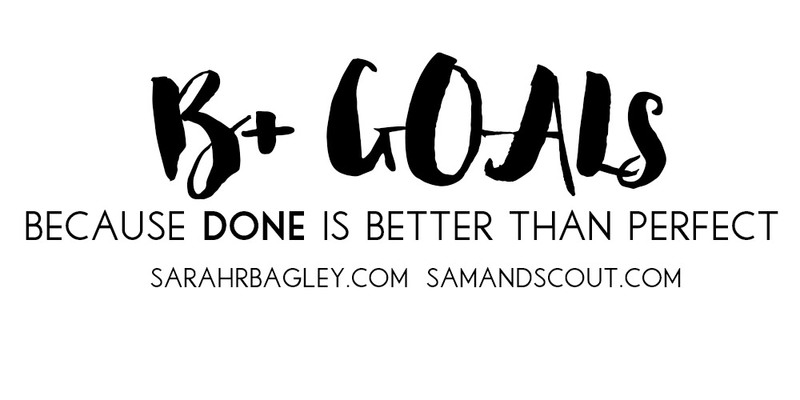 That’s what I love about this concept of B+ (or maybe D+ – ahem 1/7) goals… Instead of throwing myself a pity party and giving up, I’m choosing to focus on the little steps of progress I DID make this month. Those 8 bible studies, the 100% increase from December in gym attendance, the book Sam and I read together. Those things count too, and February is a fresh start. 1. Bed by 10:30PM; wake-up by 5:30AM; and, seriously, get to work by 7. 3. Exercise at least two times per week. Try out some new classes at the gym. 4. Buy a new water bottle and drink 64oz. of water every day. 6. Organize kids’ clothes (closets & basement). I signed up for a consignment sale and have to drop stuff off on February 13th. Hopefully that will be motivating. 7. Re-design blog (YES! Coming soon!!) and post at least three times per week. So, if at first you don’t succeed…. ADD MORE GOALS and try again! Haha! My word I picked for the year is GRACE — grace for me, grace for others! It helps me when I get all “shouldy” with myself. Someone helped me narrow things down by having me pick three things I want to get accomplished for the week and we are holding each other accountable (I was at 66% last week!). Of course I got a lot more done last week than just three things but it helps me to focus. I am enjoying your blog. I am in the process of changing careers to become a teacher (though job hunting is so brutal!) and appreciate all your useful teaching resources. I really like Burt’s Bees products for facial care, especially the Intense Hydration face wash. It smells like fresh oranges. I always keep my face wash in the shower and I’m a million times better about washing my face. I am SO glad you are going to start washing your face — smart girl!!!!! Of course, I might be a bit biased but I absolutely LOVE Mary Kay’s Night Solution. It is full of Vitamins and collagen boosting peptides — Your skin will feel so tight and awesome and it is lightweight, cool and refreshing — seriously one of my favorites in the whole line-up. Let me know if you want to give it a try!!! PS I love our Moisturizer too, but AHHHHHHHHHH the Night Solution!!!!!!! I can’t make it to work on time either! You are not alone! What is your myers briggs type? I wonder if we are the same … I am an ENFP.. timeliness is pretty much impossible for me. Honestly as a working mom I think you are AMAZING for going to the gym at all so I salute you! On the water front, there is an app that also has an apple watch version to remind you to drink more water. Its called Daily Water Free. That is on my list for February too. AAAAnd I also don’t consistently wash/moisturizer my face… I’d love to hear if you find a system that works for you! 🙂 I didn’t realize there was a monthly goal link up! I am so very excited because I had posted my January goals, so I am able to jump right in! I love James and the Giant Peach! I also love your 2 February picks; however, I am partial to the Cricket. I have a giant 34 oz. water mug I fill every night and add lemon. I also have a cup of hot peppermint tea each morning at school, so that is how I get my water quota at school each day. I am a water snob. I tried Nerium; however, there was something in it which caused some allergy issues. 🙁 I use a soap with tree tea oil and Oil of Olay. Thanks for sharing your goals. I am a gym struggler, too! Did Sam like James and the Giant Peach? We started reading the illustrated Harry Potter to David but it’s kinda over his head. Also, pumped for the new blog design 🙂 I need to do that! Go YOU for getting to the gym that much, getting in those Bible studies, and reading James and the Giant Peach with Sam! Check out the water bottle I linked to on my Favorite Finds: Maternity Edition post. I LOVE that water bottle! And I’ll email you about skin care later today if I remember. 😉 Have a couple of thoughts for you to try! My derm got me into the habit of washing my face when I was in high school, and now it seriously grosses me out to even think about laying my face on my pillow before I wash it. Blehhhhh. I use Cetaphil face wash, per for the derm’s recommendation, and Olay Active Hydrating Beauty moisturizer. It’s been a great regimen for my skin! (the moisturizer has SPF in it as well). I have always been a face washer, but just this year, my mother has started to get on to me about how I need to add a moisturizer to my daily regimen. For Christmas, she bought me a few different clinique products. I already use their CC cream moisturizer and I have started using their eye cream as well as their nightly moisture surge…but only on half my face…seriously. I’m only using it on the right side of my face and then at the end of the month, I’m going to see if I can tell a difference that would warrant me to continue purchasing. (How’s that for cheap? haha!